Welcome to A10 Talk’s Top 25 Player Countdown. Each day, we publish a new article counting down the 25 best players in the Atlantic 10 this past season. Today, we continue our countdown with #14 Justin Tillman. It’s perhaps no huge surprise that one of the largest motors in the Atlantic 10 is a product of the Motor City. Detroit native Justin Tillman finally got the minutes to really post some numbers at VCU and that’s exactly what he did. 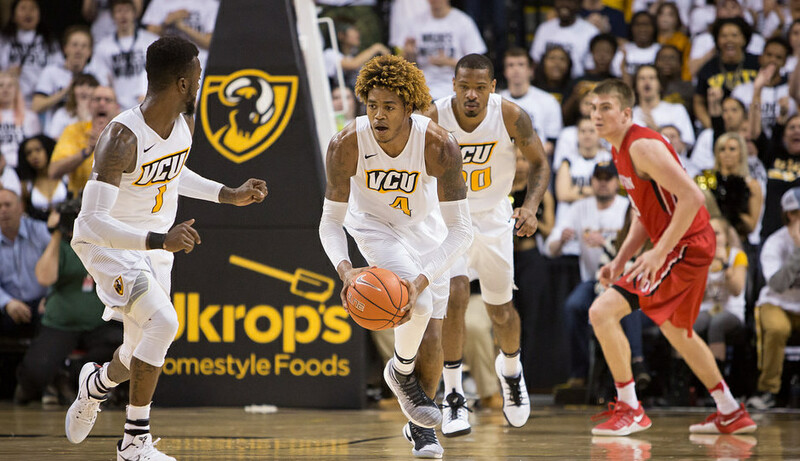 The junior with the golden fro was arguably VCU’s most consistent player and with his relentless attack of the glass and the basket, helped lead VCU to yet another NCAA tournament appearance, his third since joining the Rams. After back-to-back late season road losses to Dayton and Rhody, the Rams needed to stop the bleeding before heading into the A-10 tournament with a home finale opportunity against George Mason. Immediately, Tillman was there to apply the tourniquet, posting a 24-point, 11-rebound double-double, his 11th of the season. Tillman finished 12 of his 15 attempts that evening, tied for the most from him on the season. He had previously posted a similar performance against GW, going 10-15 for a 20-point, 13-rebound night in a 30-point blowout of GW. Those nights became a trend last season as the 6’7 220 forward averaged 12.2 point and 8.7 rebounds per game in his first real breakout season at VCU after showing flashes of just how good he could be in limited minutes his first two years on Broad St. Tillman become one of VCU’s most consistent players last season, arguably even more consistent than seniors JeQuan Lewis and Mo Alie-Cox, posting 100+ offensive ratings in all but four of his games against Atlantic 10 opponents. Tillman was plug-and-play efficiency for VCU last season. Will Wade and Co. simply needed to wind him up and watch him work on any given night. Tillman ranked top-10 in A-10 play in offensive rating (5th), effective field goal percentage (4th), true shooting percentage (6th), offensive rebound percentage (1st), defensive rebound percentage (3rd) and offensive turnover rate (7th). Tillman was clearly one of the league’s best rebounders and finished just over 60% of his shots. Money in the bank. VCU’s JeQuan Lewis came up with some of the Rams’ biggest shots this season, but “quietly” helping the senior guard lead VCU to victory in most games was the black and gold’s Steady Eddie: Justin Tillman. No.4 ranked second on VCU behind only Lewis in win shares this season (an estimate of a number of wins contributed by a player due to his offense and defense). Doing so helped take Tillman to yet another A-10 tournament final and his third consecutive NCAA tournament appearance since becoming a Ram.